Mallory killed her boyfriend, Brian. She can’t remember the details of that night but everyone knows it was self-defense, so she isn’t charged. But Mallory still feels Brian’s presence in her life. Is it all in her head? Or is it something more? In desperate need of a fresh start, Mallory is sent to Monroe, a fancy prep school where no one knows her . . . or anything about her past. But the feeling follows her, as do her secrets. Then, one of her new classmates turns up dead. As suspicion falls on Mallory, she must find a way to remember the details of both deadly nights so she can prove her innocence-to herself and others. In another riveting tale of life and death, Megan Miranda’s masterful storytelling brings readers along for a ride to the edge of sanity and back again. 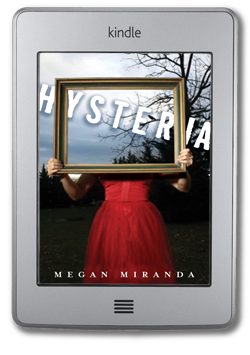 Hysteria has a distinctly creepy, mysteriousness that had me hooked right away. I loved the pacing and the uncertainty of what is real versus what’s imagined. It was a deliciously captivating story with a sort of Mara Dyer vibe while maintaining a uniqueness of its own. At the beginning of the story, you realize rather quickly that Mallory doesn’t have a full memory of what happened the night of Brian’s death. She is missing something crucial and therefore so are we as readers. We get bits and pieces throughout the story that weave a mystery which is way bigger than first thought. She’s also being stalked by Brian’s distraught mother, hated by his brother, and semi-estranged from her own family. Mallory’s haunted by nightmares and riddled by guilt which simply adds to both our suspicion and sympathy for her character. I loved the characters and their development. Mallory was a character you really wanted to believe wasn’t crazy. She’s very real and rather smart and I wanted her to be able to break through all the guilt and fear and downright crazy stuff happening to her. I liked the really awesome dynamic between Mallory and her best friend Colleen as well. It’s not often that such a focus is put on a friendship like this and it was refreshing. Reid was adorable and I loved that he sticks with Mallory even when no one else seems to. It’s a beautiful cast of delightful heroes, great secondary characters, and chillingly, evil villains. Plot-wise, the story moved along at a nice steady pace until the end. The end was where it lost something for me. There was so much gorgeous, creepy mystery that built up throughout and then it just sort of fizzled out. It felt sort of rushed and lackluster compared to the rest of the story. It’s not that it was a bad ending, just that it wasn’t a GREAT ending compared to the rest of the book. There was so much potential for more. Overall, Hysteria is a really fun read for fans of the Mara Dyer trilogy or any mystery for that matter. It’s enjoyable and entertaining and has that certain creep factor that keeps you reading just to find a spot you feel safe to stop. Yes, yes and yes. I felt the EXACT same way. I was totally into this and then all of the sudden it was over. I wanted more on what happened to a few people. It just felt a little unfinished. Exactly. And I don’t know, I would’ve liked a little more explanation of what was going on with Mallory…the marks on her, etc. I felt like it was all just explained away in a paragraph and didn’t really feel “done,” if that makes sense. Same here. That wasn’t very clear.